In honor of Labor Day, and all our mothers who worked themselves to the bone, we are showing this photo. It was taken in Juana Diaz, Puerto Rico in 1968. An interesting detail appears on the blackboard: the English class was sponsored by the International Ladies Garment Workers Union (ILGWU). This English class made it easier for ILGWU to recruit Puerto Rican women into the garment district of New York City. Or maybe the young people in this room have already been “selected” for garment district jobs in NYC. That would explain the miserable look on their faces. Puerto Rican women were very popular in the garment district. They worked long, hard hours in crowded sweatshops…and were paid far below the minimum wage, from $50 to $75 dollars per week in 1968. ILGWU did nothing for them…except give English classes in Puerto Rico. I was a small child, but left school feeling sick to my stomach. Somehow, in United States history, certain nationalities were necessary for “cheap” labor, such as “Negroes, Latinos and Asians, but not educated and brought into the U.S. for citizenship. 20th century slow toward equality for all. “…. 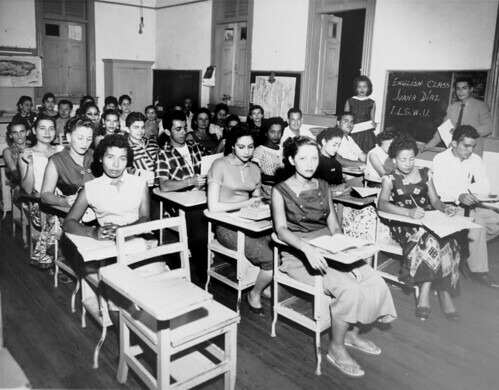 the English class was sponsored by the International Ladies Garment Workers Union (ILGWU).” ….